The time has come for Indian CFOs to move forward with cutting-edge strategies to maximize their performance and contribute to India's economic prosperity. With global disruption creeping in from all sectors, smart financial leaders require diverse skill sets than at any point in the recent past. The 15th edition of the CFO Leadership Summit will skew heavily towards catching up with the finance disruptions and developments which radically helps in enhancing the finance landscape of India. Driven by an agenda created to 'Enable the New age CFO', this conference has been designed to minimize time frame while maximizing the depth of true peer-to-peer engagement. 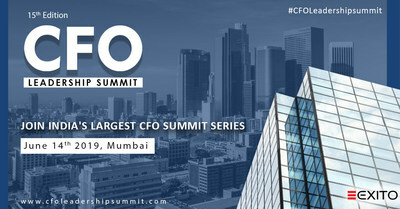 The 15th edition of the CFO Leadership Summit is a hub for finance leaders and experts to get together, network, and discuss the challenges faced in the finance industry. It is a platform for adopting disruptive technologies and bridging them with finance function to generate meaningful business associations. The best of the business finance events, the conference offers the depth of true peer-to-peer engagement and business relationship. Incepted as one of India's emerging conferences, the CFO Leadership Summit has proven to be the biggest event in its domain. The topics of discussion are chosen carefully to be relevant and contemporary to the dynamic nature of the role of CFOs across industries. Some of the topics to be touched upon at the conference are: 'The CFO today - Defining success and leadership', 'Trends shaping the 2019 economy', 'Digitech - Redefining the value proposition of finance session', 'The impact of Artificial Intelligence on Finance Industry', 'CFO, a catalyst to business growth - Future finance transformation strategy', 'The 2020 CFO's visionary: Transformative technologies to streamline finance functions', among others. The platform brings on-board some of the prominent finance leaders and experts as speakers to share the knowledge, experience, and expertise with the attending audience. Some of the confirmed speakers are Mr. Pramod Ghorpade - Country CFO at Watson Pharma Private Limited, Mr. Manish Singhania - CFO at Essar Steels, and Mr. Pankaj Vasani - Group CFO at Publicis Groupe. Apart from offering a learning and re-education platform, this summit will also offer a networking opportunity to all the attendees to strengthen their professional ties within the industry and they can avail the one-on-one meetings with the potential solution providers in a conducive B2B environment. Exito is also acknowledging the extraordinary achievements of the CFO's with the CFO leadership awards where the CFO's who have clinically contributed to their organizations' economic growth, stability, and success will be felicitated. For the sponsors, this comes as an engaging opportunity to showcase the latest developments on various technical & non-technical fronts like cashless remittances, cyber-security, asset management, risk management, financial & accounting solutions & software catering to the same. Amidst the presence of decision-makers, this can be an ideal opportunity for facilitating companies to present their solutions and establish new business relationships. For more information, plese visit: https://mumbai.cfoleadershipsummit.com/ . Exito Media Concepts Pvt. Ltd.